Wrapper Classes - Have you ever heard about them , if not , no issue you will get to know about it in this post. Wrapper Classes – why are they needed? There is a class that has been dedicated to each of the 8 primitive data types in java. These primitive types are int, float, char, byte, long, short, boolean and double. 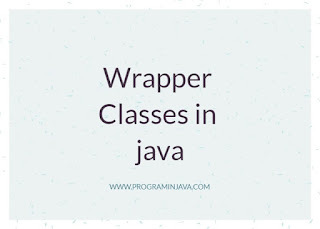 The dedicated classes that “wrap” over these primitive types are called Wrapper Classes. How can we create Wrapper Classes? 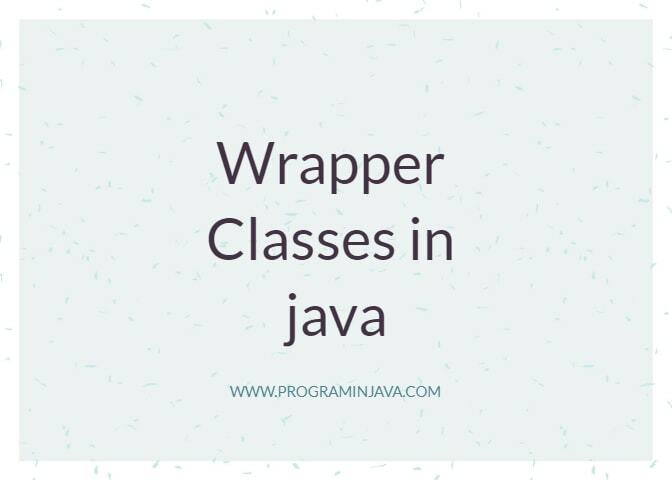 There are 2 ways of creating wrapper class instances in Java. Constructors of the corresponding wrapper classes can be used to create instances with the help of the new keyword. Another way of creating Wrapper class objects is by using the valueOf method. There are 3 variants of this method. This statement will return an Integer object containing the value represented by the primitive type. This returns the Integer object for the String passed as parameter. 3)Accepts two parameters a String and radix. The radix parameter will be used to determine the value of the Integer that is returned based on the String parameter passed. In the above example, we can see the ways of creating wrapper class instances in java. When creating using constructors, one needs to be aware of the wrapper class name and the parameters it accepts. As the wrapper classes come in last in the hierarchy, there is no subclass that one can get from them. The constructor that accepts String parameters may throw NumberFormatexception if the string passed cannot be parsed into an Integer. Using the valueOf() method seems more efficient as it returns cached objects which means that it is not always necessary to create a new object. This reduces code to convert from primitive types to Wrapper equivalents thus leading to cleaner code. The following statement from the code above is the perfect example of autoboxing. The above statement is an example of auto boxing. When a primitive is passed as a parameter where an object of the corresponding wrapper class is expected. When a primitive is assigned to a variable of the corresponding wrapper class as seen in the example above. Taking an object of one type and converting it into another is the simplest way in which we can define Casting. But obviously there are some rules that need to be followed. You cannot just take one variable and convert it into another type. Automatic type conversion or implicit casting happens if both the concerned types are compatible with each other and the target is larger/wider than the source. No casting is specifically required in the case of implicit casting. The implicit casting can be done in the following order only. In inheritance too, implicit casting is present when we assign a child object to a parent class instance. If both the concerned types are compatible with each other but the source is larger/wider than the target then it is called explicit casting. Here the conversion will happen the other way around. Similarly, in inheritance we can explicitly cast super type to a sub type. To be able to use the specific functionality of the target type, casting is done. When converting float to long I am able to store more data in it. In the same way if we want to access some methods from a super class using the subclass variables we can use casting. The object itself is not changed when you perform casting. There has to be compatibility between the source and target types when casting. I cannot cast a variable of a subclass of A to a parent of B.
Upcasting or Implicit Casting can be automatic as it will never fail. Downcasting or Explicit casting on the other hand may throw a ClassCastException in some cases. This is where the instanceof check can come in handy. If you liked this post , please share it with your friends and colleagues.